Kalandra Jane - Millinery and Musings! : Teal dress plan - the mock up. Teal dress plan - the mock up. After careful scrutiny of my knitted teal fabric and some unsatisfactory tummy-bulging when I recently tried on some knitted skirts in Primark, I have decided not to make a dress but to stick to the original pattern and have it as a top. I have a suspicion that there's not enough for a dress anyway, I have just over a metre and the pattern uses a lot of excess fabric to make the pleated sections and faux shrug section. It's also much more sensible with regard to my Autumn/Winter wardrobe plan to make a top which goes with many skirts rather than a dress which goes with nothing. 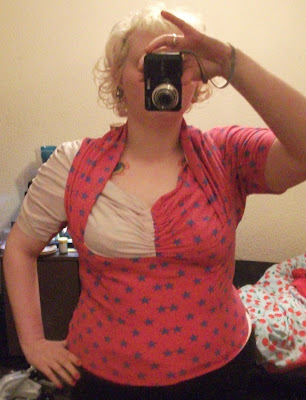 Here is the mock up of the top, cut from some crappy stretch t-shirt fabric. As you can see, I cut one piece out backwards due to the confusing nature of the pattern, and it makes me look really pear-shaped. This is because there are some serious bust issues going on - it's about four cup sizes too small, despite me adding inches to the pattern. It should be relatively easy to rectify now I've worked through the construction once. 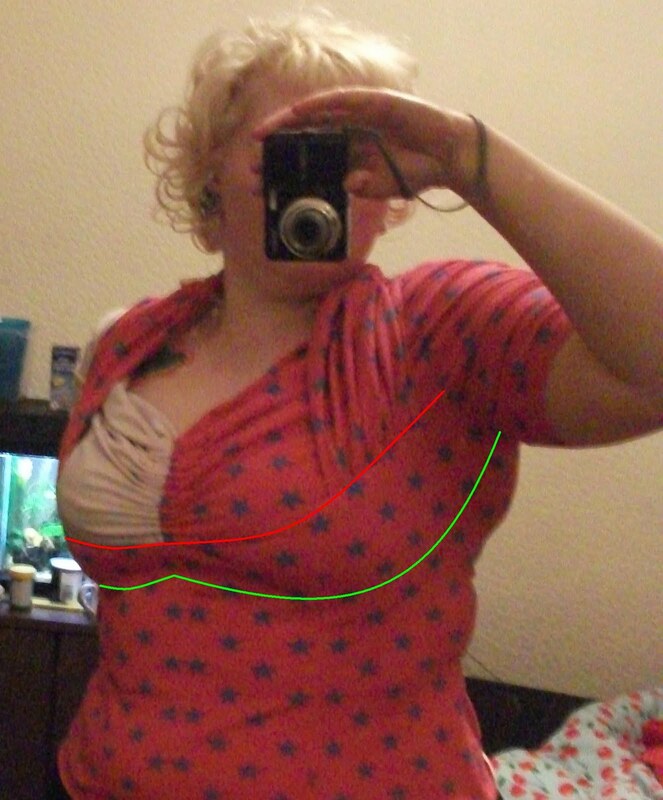 The red line shows the underbust line of the top, the green line shows where it needs to be! Also, I'm not convinced that a top made from a stretch fabric needs the four waist darts shown in the pattern, or that there is any need to cut the front of the top and the bust section as two sets of two mirror-image pieces and sew them together - it seems to me that it would be perfectly viable and much neater to cut each section as a single piece on the fold. What do you think about the darts and the front pieces being unecessarily bisected? It just seems like an awful lot of unecessary seams for a stretch knit fabric, I think it would look much neater if the lower front was one flat piece. It looks like it'll be really nice in that teal fabric! I love shelf bust dresses and need one pretty desperately. Yeah, I think the darts and front seam could easily be done away with. It would be easy enough to take a bit of extra curve out of the side seams at the waist if necessary. 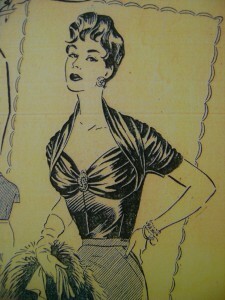 Though the skirt I plan on wearing mine with is high-waisted so it covers most of the length of the darts anyway. Autumn/Winter wardrobe plan - completed items!